This entry was posted in Mac and tagged Apple Script, MacBook Pro, Touch Bar, widget by LucaTNT. Bookmark the permalink. If I press the cross to the left of the widget, it disappears. I find that I have to go into “advanced configuration” and press save, then it’s back. Is there a better way of restoring the widget if closed? Or perhaps set it up permanently? That’s a feature of BTT, as it allows you to dismiss its custom Touch Bar to reveal the system/app one. 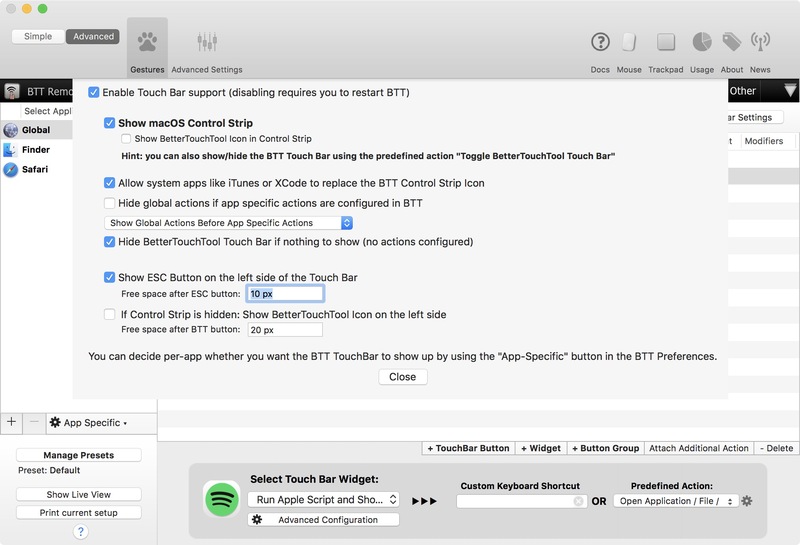 You can however define a shortcut in BTT that launches the action “Toggle BetterTouchTool Touch Bar” to quickly show/hide it. Not really: the ability to show BTT’s custom buttons in any app is BTT-specific, not macOS native. If you quit BTT, you will see that the (x) at the very left of the native control Strip is still there. It is not added by BTT, this is how Apple wants you to switch between the two Touch Bar layouts you choose in the native Keyboard settings (System Preferences). What I meant is that if you hide BTT’s actions with the (x) you’re referring to, you can not make them appear again without either going into BTT or using a shortcut you defined in BTT itself (which is what I did). Thanks for that, works beautiful! I get the script to work but, if I leave the bettertouchtool button from touch bar and go back it no longer displays name of song. just name of widget. Is there anything I can do to limit the number of characters shown on that display? If a song name’s a bit longer than usual it takes up the entire touch bar. This displays the first 50 characters, you can adjust this arbitrary limit however you want (be sure to replace 50 in both lines!). The widget worked normally for while, but now it stops displaying the song that is actually playing. It doesn’t display the current song anymore, and is stuck on this song that has been already played 3/4 hours ago. Any help? Thanks! Props. This is great! GeekTool in the touchbar basically. Scripts work perfectly. That is what I’ve been looking for, thanks for the article. I have critical questiosn though. When I add widget with itues(or whichever), it starts displaying but It stops displaying after I press button “X” which is displayed before ESC. and after that I need to to save widget again to see current track. (X) ESC itunes-playing track touchbar controls. Is there any way to get rid of (X) and always see currently playing track all the time regardless of application? That’s the expected behavior: the “X” closes BTT’s custom TouchBar. I set a shortcut in the Keyboard section of the app that allows me to quickly open it back as needed. You have to look for the “Toggle BetterTouchTool Touch Bar” action, which I mapped to ^⇧T. im having a weird glitch in which random song titles are cut off. it can vary, some longer ones display just fine, others are cutoff. the long one below shows just fine, but “Planet” is cutoff. any suggestions on a fix? edit: think i figured it out, i added a couple extra spaces between the artist and song title, that seems to have done the trick! You mean showing three buttons like these? but didn’t work, is there a way can make it happen? I’ve followed the steps, open up spotify and it just shows the date, time, GMT and year we are in. You need to remove the first line of the script. When you add a new Widget and click the ‘Advanced Configuration’ button, BTT puts a default script (`return do shell script “date” #example: execute a shell script and use the result`) that returns the Date/Time. That script is just an example, and should be removed. Luca it’s awesome! I’m trying to do the same thing with SoundMate app 🙂 Looks like they have a different dictionary.. any help? Is there a way to add a custom button which would add the currently playing song in a spotify playlist? Hi! Technically it would be possibile, it just wouldn’t be this easy: Spotify does not offer AppleScript actions to manage playlists, so it would need to be done through their API, which is not something I can whip out in a couple minutes. hi! this is great.. i just wanted to know if instead of the spotify or itunes icon, i could display the original album artwork for the song.. I don’t think that’s possible, unfortunately: the icon can only be a static image. For me, this is still theoretical. The above works for getting base64 data; now I’m working on returning that to BTT as described in the github link. I don’t think it’s possibile – well, not easily – since Sonos.app does not appear to have an AppleScript dictionary that could expose the current track. Is there any way to add play/pause/next icons and have this as the main now playing control bar for Spotify? Yes it is possible to add previous/next/play/pause buttons (you’d just need Apple scripts that trigger those actions), but they can’t replace the native now playing control AFAIK. 1. No need put space, you can write anything cool, like ‘Play Music’ or ‘Open iTunes’ for example. 2. Also, Instead you can put space as advised, then change button colour to BLACK, the button will disappear leaving just the icon. I do this with custom text or app name, looks way cooler I think. Hey really great tip ! • If there would be a way to display itunes control touch bar features when press on the Better touch bar — iTunes: track ID. • Instead of Itunes Icons: show album cover ? • And maybe track Time ? Just saw that my question about The album cover is already here and impossible… sorry. Is there any way to automatise the launching of the script at the end of the playing track instead of having the script running every X time ? But if I want to display lyrics on my Touch Bar. It’s not easy. You would have to find some API that would give you the timestamped lyrics and somehow sync it to the playback. I think it’d be more effort than it’s worth. This for some reason stopped working for me. It now just doesn’t update when the song changes, even though my settings are correct. Anyone else having issues with the latest version of BetterTouchTool? Would it be possible to make a tutorial on how to put lyrics I would really appreciate that. Hi Luca, thanks for this but I wonder if you can help me. I am running the Mojave dev beta and so far I cannot get any version of iTunes now playing widget to work – it just doesn’t appear in the Touch Bar. Do you know if this is a know issue with AppleScript and Mojave that I just haver to wait on, or if there is a fix? I don’t really know, I’m not yet running Mojave on my main Mac so I haven’t tried debugging the issue. I’ll update this post when I upgrade and (hopefully) manage to solve this. Thanks for your comment with the error, it helps to point me in the right direction! I didn’t like the way that BTT took over the touch bar (also, I didn’t want to pay for it), so the next-best way I could find was to add the “Now Playing” widget to the Notification Bar and when I want to see what’s playing it’s just a two-finger swipe from the right. I think this is better than using the touch bar, and when I want to use that I don’t really need to see the track title. Hi I don’t really understand how to get the spotify icons as the icon. Where is the .app bundle? Is it in BTT?? The .app bundle is the Spotify/iTunes app itself. Look for it in the Applications folder, right click, show package contents, navigate to Contents/Resources and look for the .icns icon file. Can this be done with the Google Play Desktop Player? If so how. I tried changing the word Spotify to ?Google play Desktop Player” but it did not work. I don’t think so. Google Play Desktop Player doesn’t seem to offer AppleScript capabilities, AFAIK.